Two young ladies contend with the Royal College of Wizards in Regency London: First in the series filled with “magical twists and turns” (San Diego Union-Tribune). Since they were children, cousins Kate and Cecelia have been inseparable. But in 1817, as they approach adulthood, their families force them to spend a summer apart. As Cecelia fights boredom in her small country town, Kate visits London to mingle with the brightest lights of English society. At the initiation of a powerful magician into the Royal College of Wizards, Kate finds herself alone with a mysterious witch who offers her a sip from a chocolate pot. 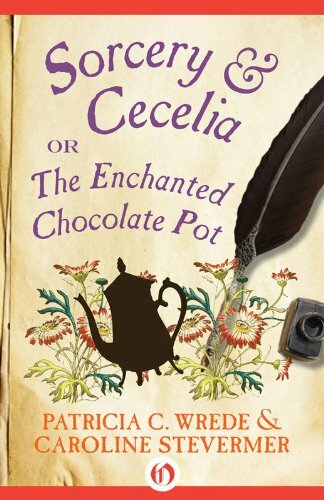 When Kate refuses the drink, the chocolate burns through her dress and the witch disappears. It seems that strange forces are convening to destroy a beloved wizard, and only Kate and Cecelia can stop the plot. But for two girls who have to contend with the pressures of choosing dresses and beaux for their debuts, deadly magic is only one of their concerns. This ebook features illustrated biographies of Patricia C. Wrede and Caroline Stevermer including rare photos and never-before-seen documents from the authors’ personal collections.